Denim has been dominating the runways recently and the reason why designers love this fabric so much is because of its versatility, it looks good in just about everything. 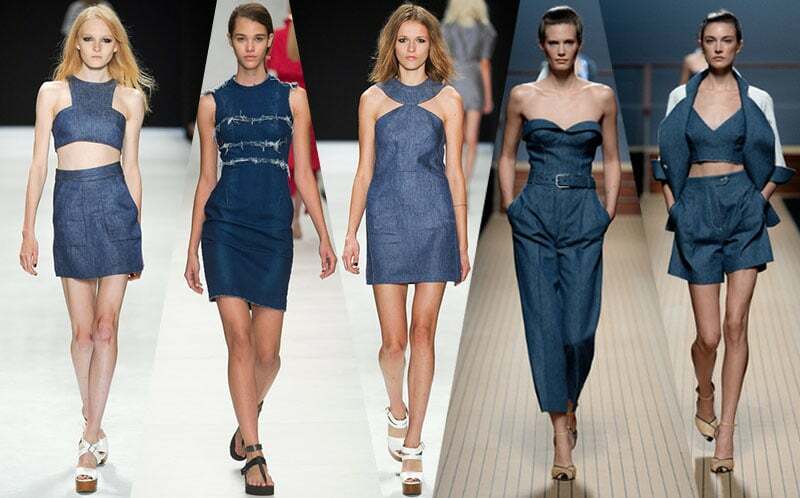 From the classic denim jeans, to the superb suits at Ermanno Scervino, denim dresses at Jill Stuart and Marios Scwab, denim bags and even denim swimsuits, it appears that there is nothing that this durable material cannot be made into. Almost every single woman has something denim in her wardrobe, especially jeans which have served as a timeless style staple. Gone are the days of the one shade of denim and the single traditional style of jeans, designers are getting more and more inventive with this casual yet edgy fabric and we have been impressed by the artistic creations that have been sent down the catwalk. 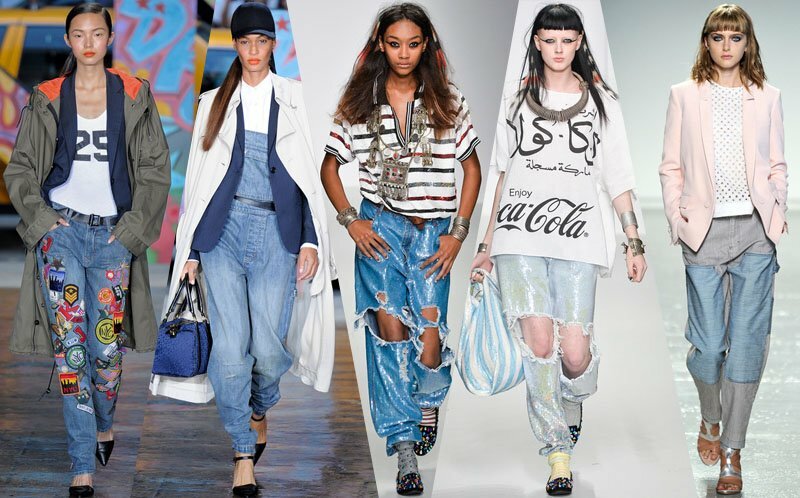 One of the most popular trends that have been emerging is the decorated denim trend. We have seen everything from the subtly sheer decorated pockets at Louis Vuitton on a light pair of jeans, to full embellished garments covered in tiny studs, diamantes or bold patterns printed directly onto the fabric. We have also been inspired by designers who have brought back the 90s-inspired grunge trend. 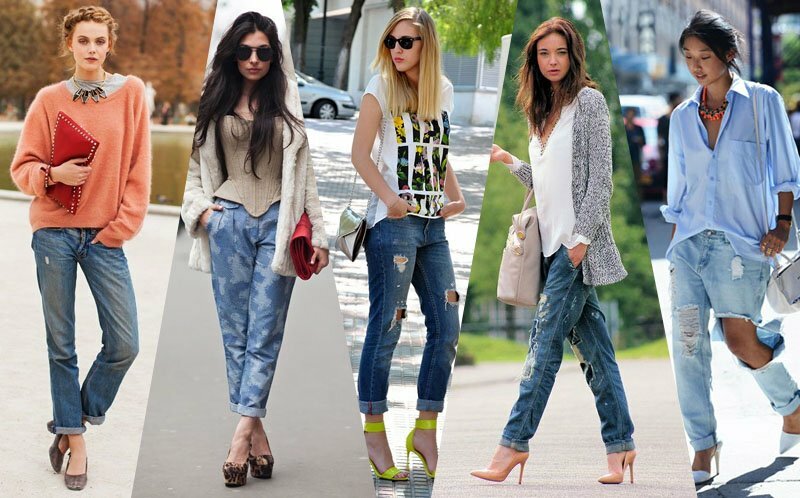 Baggy, bold and worn, these jeans make a statement. We loved the bright logos and the fun element on DKNY’s S/S 2014 jeans. The classic denim pencil skirt by Ashish, as well as the ripped jeans and paint splatter that was thrown into the collection. The lingering question is: What jeans will look best on me? Well, that is largely down to personal preference and style. However, we do have one or two tips to get you started. The five main styles are: skinny, straight, bootleg, flared leg and slouch. What looks best on you is really up to you, but the broader and wide leg styles are currently trending. Skinny jean always chic, flattering and easy to dress up, they are also a style that has remained popular for far more than one season. And that in itself should be telling enough. Slouch jeans came about as an anti-fashion statement and in comparison to the skinny jean style they have a fairly slouchy fit at hips and are loose but slightly more fitted on the legs. For a relaxed look, these are the ideal option. Bootleg and straight jeans are two relatively moderate leg cuts and are simple, easy-to-wear and extremely comfortable. For women who are top heavy bootleg jeans are great to balance out your figure and flatter your curves. On the other hand, straight jeans are great for women who want a classic pair of jeans that have the perfect fit (not too lose and not too baggy) they are also great for short women, as the style elongates their legs.